I can't believe 2014 is lurking right around the corner. I also can't believe I'm thinking about appetizers for yet another new years eve! The past few years we have either went out to dinner with some friends and went over someone's house to ring in the new year or just stayed in and pigged out on a variety of finger foods. The last time we went "all out" and really partied was heading into 2006. That means I was 23 and partying made much more sense back then. This year we are staying in and I decided to cook us a nice dinner. 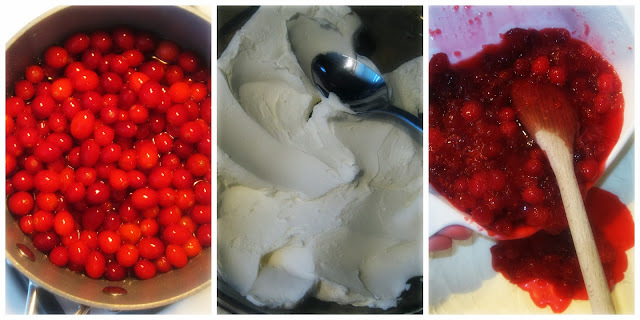 I'm thinking to start with, a fresh caprese salad with a balsamic drizzle, a crockpot chicken meal, wine for the hubby, sparkling cider for me, and this here cranberry dip. And for dessert, possible molten lava cakes with whipped cream or a simple vanilla bean ice cream with homemade caramel sauce. Or maybe just more of this delicious dip! It's totally dessert worthy in my book. The salty, savory and sweet flavors of this dip are just perfect together. It's so simple to make and actually a bit fun at the same time. Apple slices or crackers are all you need for dipping. Or if you want to get really crazy, spread it on a toasted bagel. I'm contemplating on doing just that. That has to be insanely good! Everything combined just tastes so fresh. You'll have to just try it and see for yourself! Bring water and sugar to a boil in a sauce pan over medium-high heat; stirring occasionally. Add cranberries and simmer/stir for about ten minutes until cranberries have split open and become soft in texture. Add in the lemon zest and stir well. Bring to one more boil then take off heat. Pour mixture into a bowl and leave out to cool at room temperature. Spread the cream cheese neatly out onto a pie plate or a shallow dish with sides. Once cranberry mixture is cooled down, pour and spread onto cream cheese. Cover and refrigerate for at least an hour. If I were you, I'd add this dish to the appetizer/dessert menu. What are you doing for New Years? Cooking/going out/finger foods? Are you more of a straight sweet tooth or sweet and savory is what you crave?